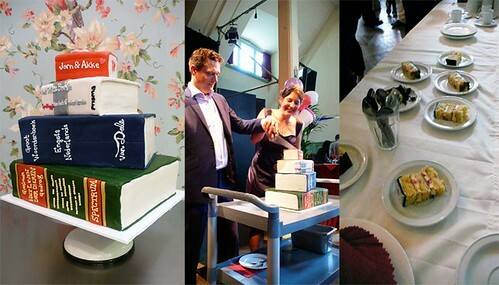 Jorn & Akke Wedding Cake, a photo by CAKE Amsterdam - Cakes by ZOBOT on Flickr. Stack of Books wedding cake made for my friends Jorn and Akke. The Flavor was Vanilla and Chocolate Cake with layers of Orange Citrus Buttercream and Fresh Raspberries! One of my recent FAVES! YUMMMMY! The Flavor and design of the cake (with their favorite books) was created especially for them! It was a truly LOVELY evening! I rarely get to go and experience the moment first hand, so it was a real honor for me to be there and also serve the cake! FANTASTIC!